To celebrate Shakespeare’s official birthday, director and producer Yvonne Murphy has shared with us some thoughts on Shakespeare and the latest Omidaze (Oh My Days!) production of Romeo and Juliet, coming to Cardiff later this month. In 2008 Yvonne founded Omidaze Productions, which now has a reputation for exciting Shakespeare theatre and generally shaking things up a bit. What is special about the Romeo and Juliet production this year? When the referendum happened last year I watched and listened to our country fracture. British society is at a crucial point in its history and I believe we need space and time to have a proper conversation about what kind of society we want to live in. We are a generation away from the Second World War after which we reshaped our society for the better. I would like to think we are enlightened enough that we can make the necessary fundamental steps, which are now needed without conflict as a catalyst. I struggled post the referendum to know what I should do next. I felt silenced and fearful. I questioned the role and direction of theatre and the arts generally and what Shakespeare had to do with anything anymore. I went a long way away to come back round to Romeo and Juliet. A story of society. A morality tale of how a broken and dysfunctional society puts at risk the futures and lives of our young people. If Romeo and Juliet had felt empowered, felt able to influence those in power and listened to, then they may have made better and more informed choices. We ignore our young people at our peril. It is all of our responsibility to ensure there is no conflict on our streets and our society is a place which values equality, knowledge, tolerance and understanding. And above all it must be a society in which no one feels fear for themselves and those they love. What is distinctive about putting on productions of Shakespeare in Wales? Shakespeare takes time to do well. I have fought for that time. Unless the actors understand the verse structure and every syllable of what they are saying how can they hope to communicate it to an audience? Especially a non-traditional theatre audience who are not used to hearing the language? A four-week rehearsal period is not an artistic decision, it is an economic one and one which needs to change if we are to produce classics of quality. I feel very privileged that the Arts Council of Wales and all our partners felt able to invest in Omidaze to do this work in this way. Wales is a small nation and one which I think would benefit from less catergorisation of art forms and more breaking of boundaries – I am interested in melding artforms. I am interested in what entices audiences across class, ability, race, gender and age into a circus tent and what creates barriers to the same people for theatre. In all my shows I attempt to blend and break boundaries of different artforms, (circus, stand-up comedy, dance, visual art) to allow as many people as possible a route into the work. I also made a conscious decision to cast as diverse a cast as possible. If I want to reach a non-traditional audience for Shakespeare then the people on stage must reflect the people on the streets of Wales and Britain. Much work is needed to increase and diversify our casting pool in Wales and then create enough strong quality work and development opportunities to keep talented actors and creatives here. Omidaze is not just about putting on a show: you are also involved in educational projects. Do Shakespeare’s plays offer room for ‘inspiring change’ or are you always reacting against them? I am never reacting against the text. The text is my absolute starting point and what I begin and end with. It is a story which needs to be told. I do not come with a concept which I want to squeeze the play inside. I read and read a text and let it resonate within me and find the story which I feel strongly needs to be told right now. I am however reacting against how Shakespeare is often done. My starting point for the trilogy was to ask who is Shakespeare for and where and how can it be staged, by who and for who and why? Shakespeare is a gateway art. It opens doors, raises expectation and ambition levels and it belongs to all of us. It is a gift which we must share because to close that door is to shut off a light to people. I was deeply concerned by the lack of gender equality in the theatre industry and I knew Shakespeare was a good starting point to raise awareness around that discussion. However, conversation of equality cannot and should not be confined to gender. Equality is all about power sharing. There are no villains. Just years and years of doing things a certain way and years of lists being created of people to use whether that is a lighting designer, production manager, voice coach or actor. It takes time, energy and conscious effort to change those lists and so that is what I decided to do. In my own small way. The educational aspect of Omidaze is at our very core. It is not an add on. We rehearse live in schools in front of young people to break open the process. We create workshops to accompany the work and invite young people from disadvantaged areas into our dress rehearsals. We open the doors to young people looking for work experience and we hold Q&As whenever we can. Theatre and the arts in general are in a state of emergency. If we only see arts subjects in schools as vocational and then see a career in the arts as too precarious for anyone not from a stable financial background the voices and work will not represent modern Britain. The arts and culture belong to everyone. We must value them and their impact and create a strong society with them at its core. Whoever heard someone tell a child to only study Maths or Science if they want to be a Mathematician or a Scientist? 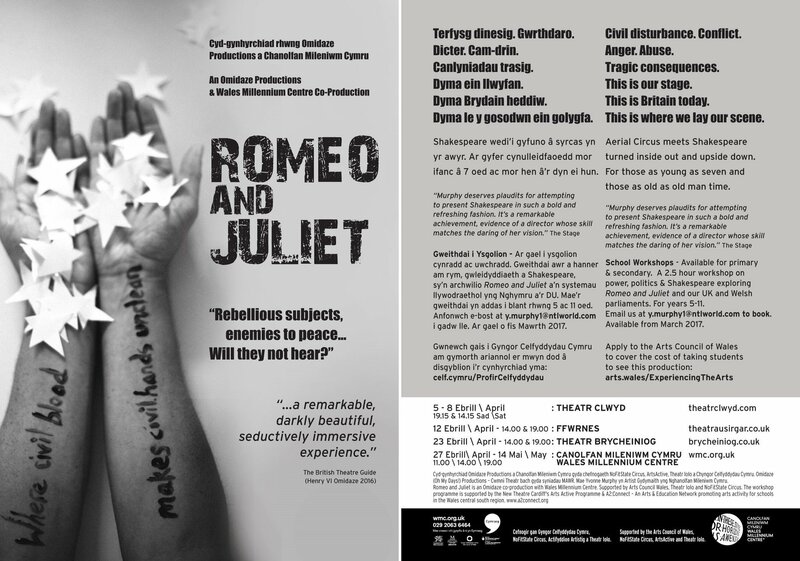 Read the Cardiff Shakespeare review of last year’s Omidaze Shakespeare production. If you would like to contribute Shakespeare-related news or reflections, please get in touch with me (Johann Gregory). Hamlet is a play that is familiar even to those with no direct experience of the play – whether it’s a general knowledge of a much-adapted plot or the countless lines that have made it into common usage. So it is an achievement of a director and cast to not only make the production feel fresh and innovative but also for lines so often uttered they are virtually cliché to sound new. Robert Icke, former artistic director of Headlong, now associate of the Almeida inserted new life into Oresteia last year, and it’s in a similar vein he has approached Hamlet, starring Andrew Scott as the Danish Prince. The production is modern dress and makes use of video technology but it’s period is indistinct, at times feeling in the present moment, others having a slightly futuristic air. The major change it feels Icke has made is a shift in pace to the expected ebb and flow of the piece. Gaining infamy for a nearly four hour running time, it doesn’t feel like the theatrical marathon it is. There is a natural pace to the overall piece, and within each scene, down to each line that Icke seems to have taken apart and put together again. Although the first segment is familiar in its staging, approach and length, there is a clattering towards a finale that despite some additions – some from the first Quarto lines, some dialogues additions to staging – that give this take a freshness. The contemporary staging – so often nothing more than some suits and contemporary furniture – is woven into the staging effectively. The play opens with news footage of King Hamlet’s funeral, and across the play video is used, from a Skype meeting with the ambassadors, to filming The Mousetrap, through to war footage and final evocative images that show integration and addition of film and stage at their most effective. Most engaging of this is the staging of play-within-a-play The Mousetrap in which when Claudius storms out, disrupting both the staged performance and the filming of the royal family, the ‘Pause’ created is so realistic for a moment it feels like there is something genuinely wrong. These elements of meta, thrown back onto the audience across the play, make for an engaging and challenging reading of the well-worn Hamlet. Of course, any Hamlet is only ever as good as the actor playing the title role. And again, Andrew Scott brings to light elements of the part that even in those moments that usually feel so familiar, there is a different slant to Scott’s performance that creates a freshness. The early and end scenes are emotionally charged and made for the most moving portrayals of the part in memory. In the early scenes, Scott veers from quietly grief stricken to unhinged and over the top from moment to moment. Scott’s balancing of the two elements of grief stricken and depressed works, and although at times the moments of exuberant grief and madness may seem ridiculous, it is because Hamlet himself is indeed at times ridiculous. The intimacy of the venue works in favour of this portrayal as well, with the loud, abrasive Hamlet feeling too close to be comfortable, and the quiet, reflective Hamlet feeling intimate and moving. Robert Icke’s production has successfully re-invigorated Hamlet in his staging, using the contemporary elements rather than simply creating a backdrop of them. Meanwhile Scott’s Hamlet offers a different take on the classic role, and perhaps one unexpected from the actor. He is a contemplative, but emotional Hamlet, caught in a changing world on both a personal and political level. It’s an intellectual challenging Hamlet for the audience, but also one which resonates with the underlying emotion of the piece. You are currently browsing the Cardiff Shakespeare blog archives for April, 2017.